Connecticut’s rocky shoreline and its many treacherous ledges and islands in Fisher’s Island Sound and Long Island Sound, constantly kept mariners on the alert, claiming the lives of many during New England’s fierce storms. Lighthouses were built to help the increasing shipping traffic and local mariners during these storms, many on those dangerous islands and ledges. 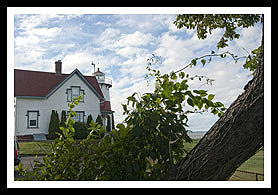 Lighthouses were built in the Stratford region around Stratford Harbor due to the consistent foggy weather, and on the dangerous Stratford Shoal. Bridgeport had become a major commercial fishing port so one was built on nearby Fayerweather Island to guide mariners into Black Rock Harbor, another built on the end of a protective breakwater in Bridgeport's inner harbor along with another light (recently destroyed Bridgeport Harbor Light), and on Penfield Reef, a much needed lighthouse was built on what is considered to be one of the most treacherous ledges in Long Island Sound. 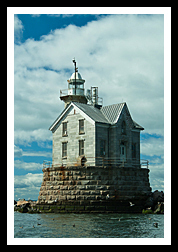 Click any lighthouse image or link below to find out information about each lighthouse including historic snapshots, directions, more photos, and links for places to visit. 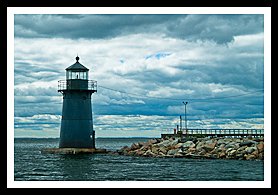 Of all of Connecticut's 20 lighthouses, fifteen Lighthouses are best viewed closely by boat, or you need to take a boat or ferry to access the lighthouse, and only five Lighthouses are easily accessible to visit for close views by car. 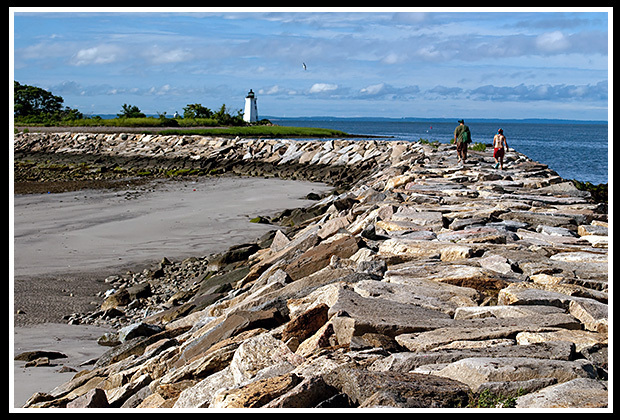 Fairfield Connecticut provides fine beaches, parks, cultural events, and quiet places to hike and walk around this scenic area. Nearby you'll find the Birdcraft Museum & Sanctuary, the oldest private songbird sanctuary in America. The historic city of Bridgeport offers plenty of diverse cultural events, the Barnum Museum, home of PT Barnum's circus impresario of the 1800's, and the Beardsley Zoo. For those who want a more historic venue, Boothe Memorial Park and Museum sits on a 32-acre site believed to be the oldest homestead in America. The Dundon House, a building constructed in Victorian Era design, features an exhibit of Bridgeport’s maritime history, its 3 local lighthouses, and historical artifacts relating to the oyster industry in Connecticut. The collections include plenty of photos, models, and eighteenth century navigational instruments. Captain’s Cove Seaport is a complex of buildings that includes an amusement center, a 400-seat restaurant, lots of specialty shops resembling a typical seaport village, and it promotes music festivals and events. Black Rock Harbor, in Bridgeport, is connected by a mile-long breakwater from inside Seaside Park. It provides scenic views of the area with the beach area and park well maintained. Stratford offers plenty of cultural attractions as well, including the Shakespeare Theatre and Boothe Memorial Park. Visitors who are looking for natural public wildlife resources will enjoy the Stewart B. McKinney National Wildlife Refuge. A popular place for birding is Stratford Point island, and in the early autumn, tens of thousands of migrating monarch butterflies appear on the island. Boat cruises mentioned below offer many types of cruises. While some may offer specific lighthouse cruises, some will pass by specific lighthouses as part of charters, narrated wildlife and historic tours, ferrying passengers, fishing tours and other types of excursions. Uses a special catamaran called the "Spirit of the Sound," and is the only research vessel in North America with hybrid-electric propulsion, very quiet. 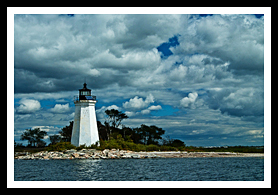 In addition to marine life study and birding cruises, they offer lighthouse cruises along Long Island Sound in the Spring. 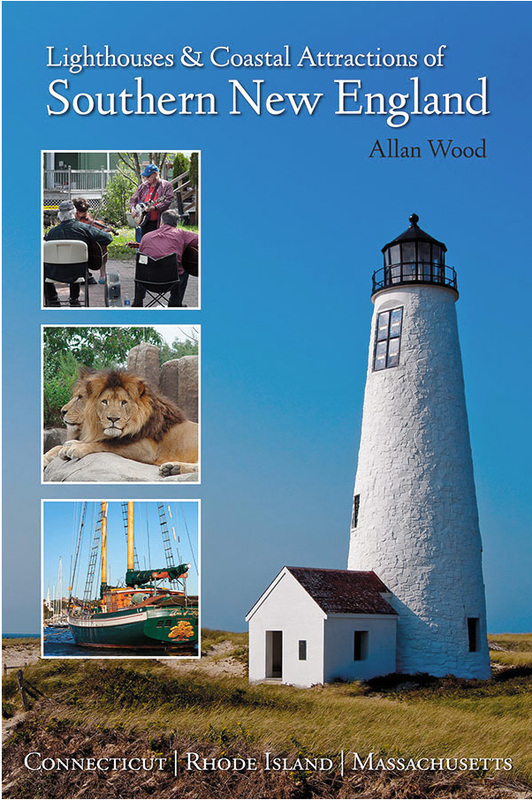 My new book, Lighthouses and Coastal Attractions of Southern New England: Connecticut, Rhode Island, and Massachusetts, provides lots of special human interest stories from each of the 92 lighthouses, along with plenty of additional indoor and outdoor coastal attractions and tours in the area, with contact info to plan your trip. I'll be happy to sign it for you here, or you'll find it in any fine bookstore. 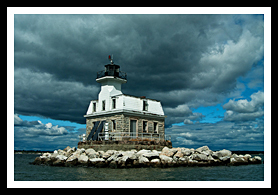 In the book, with stories from each lighthouse, you'll find a few local special stories on haunted Connecticut lighthouses, some acts or heroism, and the story of one keeper's detailed encounter with mermaids.